Our most popular FunShop™. The landscape of Grand Teton NP has turned to brilliant golds, rusts and browns wetting our appetite for great scenics. We arrive before dawn at Schwabacher Landing and we wait for the sun to kiss the tops of the Grand Tetons. The reflection in the beaver pond and autumn cottonwoods add the perfect touch to our first image of the day. Then on to Mormon Row to get the classic shot of the barns with a fall color backdrop. That’s just the first morning and we have many opportunities awaiting us. We head to Oxbow Bend but not for scenics, instead we look for grizzly bears. 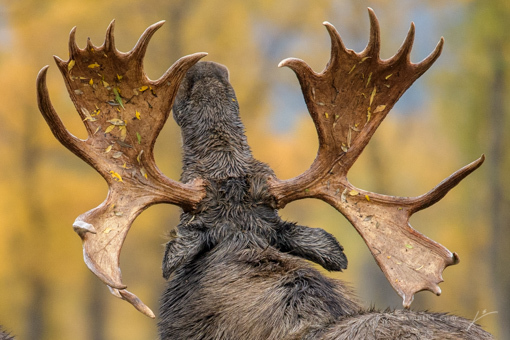 We also look for moose and elk in the rut.This is the best time for see the entire mating process. If we get lucky we may even see them mate. Pronghorn, coyote, and fox fill the memory cards and this is only the first day! Join Jim and Kathy Stamates for 4 wild days to learn, shoot, and experience Grand Teton National Park in the fall.